1. you can be allergic to turkey???? 2. what do you eat on Thanksgiving? I was teaching at the Valley Forge Military Academy when awareness should have kicked in, before the final time I purposefully ate turkey. As my body purged itself, I realized that there had been a trend of my body not reacting well. I had been warned, but not until I was amazingly ill did I decide to never eat turkey again. It was graduation day and it was 90 degrees and it was awful. Do I remember correctly that I put on my uniform and attended graduation? Wednesday evening I felt no desire to get out of bed to eat dinner, but I did. Sometime around 9:00 I joked that I had been poisoned. Then all night long I remembered how sick I had been that day in 1987. Now for the first time in 23 years of teaching, I have called out sick for two consecutive days. Those who know us, know we rarely watch TV. However, with the Olympics coming I got the TV all prepared with rabbit ears and all. At some point last night I woke up and realized I was watching an episode of the A-Team, a show I never had had a desire to watch. I ate some crackers, drank more water and amused myself with bad TV. What had been planned as a night out in a historic inn listening to live jazz had been transformed. You know you are sick when you would rather be watching bad TV then all the other activities that normally fill your day. Yesterday, I wasn't up for any extended time on the computer. Maybe things are looking up. But for now my mug of tea is empty, so I am headed back to where I have been spending most of my time these days. a place where I have been pondering if the same warning signs have been trying to get me to stop eating chicken. In my last post, I spoke of a fortune cookie telling me I was headed toward a career change. After some dreams this weekend, I am trying to sense what God desires. dream one... I am directed to a location away from the school. I am with a group of folk who I do not recognize. Then a friend who was laid-off last August tells all of us we have worked our last day. As I am leaving the room, I stop. I am curious as to why I am being told this, since I don't work there. He says, "The school wanted me to tell you." I wake up. A few minutes later I am back into the dream... I enter my classroom and it has been stripped clean. All my clutter gone. So are the plants. I wake up. Later that day, I joke that I need to seek counsel from a fortune teller to make sense of these dreams. Mosaic Woman responds, "Do you remember what happened to King Saul?" I do. Last night I dream again... I am at work and a friend of many years approaches and hands me a card. I say, "Wow." I am staring at page after page of birthday wishes from all the folk I have worked with at the school. I wake up. and that is all I will say. let folk know that God does not take kindly to demands. When the leaders said to the people, "Give God five more days to solve our woes..." She told them a thing or two. and this... while others have no plans but to pray, think outside the box and ask God for the skills you need to solve the problem. God may just make you a liar and hero because of your ability to lie. At school I watch as the girl, who loves flowers and chose a 1000 to plant in this years garden, still helps with the planning. In December she thought she would be seeing all those flowers this summer. Now she has been told she will be leaving this June as the school will no longer have a residential program. Has she made the connection that she is planning for a garden in which she will not spend time. I will so miss her bouncing into my classroom with photos of flowers for me to see on her flashdrive. Today at lunch my fortune cookie told me I would soon have a change in careers. I briefly signed on to a job website then left. Do I pray to God to have job search skills or to have the compassion to help my students get through the next 6 months? Ignatius said... don't make big life decisions when in the midst of troubled times. 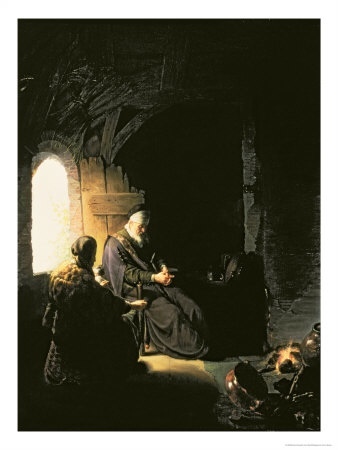 Going deeper into Anna and Tobit... 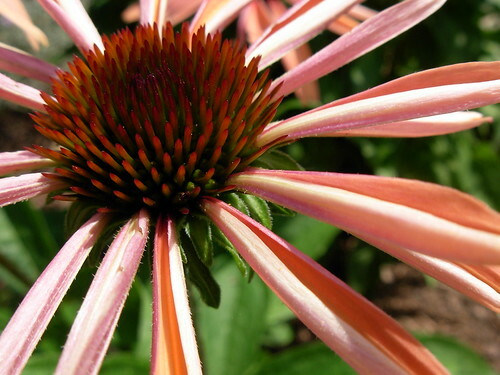 I desire to shine like a coneflower, like Christ. We returned to work on Monday to get the promised, but secret if not hinted at big news... our residential program will be closing down as of June's graduation. Much talk among friends since then with more than one assuring me that my position "must be safe." Who knows? Reassurance didn't help Anna and it doesn't help me. Monday evening I walked to my church. And spurred on by a friend, who thought it wasn't a "great" story to say the least; and a friend, who had never heard it... I let loose into story telling mode. It is my best mode by far and I laughed out loud as we explored scripture. in contact with may feel your presence in our soul. shining on those around us. sympathetic influence of what we do. That is what was hiding in my Bible, a prayer by Cardinal John Henry Newman, which is read daily by Mother Theresa's Missionary of Charity. This prayer resonates with my belief in God. I want to shine. I have read it every day this week. Two hours later, I sat to Examen my day and I wrote "Where are your righteous deeds?" into my journal. I decided then that I would focus on teaching science and gardening and let my job be what it is and what it will hopefully be. Basically to live with uncertainty. I decided that I would bake bread with my students the next day as they came back and heard the news. And I would sell none of it. It would all flow into my students, well, I did eat my share. Then after examining my day, I picked up "Inviting God In" by Joyce Rupp, and the random meditation included a quote from the above prayer. I want to blog about prayer on Monday night, but time, energy and gumption has me going in this direction. OK, so as far as I can tell someone named Johann Christoph Schmidt, took Handel's music from here and from there, and set it all to the story of Tobit. Here is an aria by Anna rejoicing when Tobias has emerged from his dangerous journey. Before this past week, I didn't know any of this existed. Tobit is thrown for a loop by those words. And he lands in despair and the very next thing he does is pray to God. He does not pray to have the strength to ask for the love to treat his wife in a righteous manner. No, he asks to die. Tobit has not had it real easy leading up to this conversation. Maybe he does not want to fall farther away from the righteous person, who before being blinded, would risk his own well being to bury those who had been executed. Anna will have two conversations with Tobit during which he tries to reassure her. The first time it works and her weeping stops and she has some hope her son will survive a dangerous journey. The second time shows why reassurance is not what mournful people need. And Anna makes it real clear she does not feel better about her son who has not returned in a timely manner when Tobit reassures her that he thinks he is fine, just delayed. However, after this fight, when she sees her son, she does one thing before running off to greet him. She tells Tobit. as I read Tobit this week, I kept thinking, I know this story, so I assumed it was from when I read the Bible several years ago. And it may be, but much more recently (a google search reminded me) I read a novel by one of my favorite authors, which was based upon this story: On the Road with the Archangel by Frederick Buechner. On New Year's Day Mosaic Woman and I went down to The Philadelphia Museum of Art. Our busy life as crafters had kept us away, so we planned to see the Arshile Gorky exhibit while I was on vacation. The first plan was changed, when I agreed to make tamales, but that is another story. As for the Gorky exhibit, Mosaic Woman has given it a wonderful tribute here. The museum has live music on Friday nights so instead of the coat check room, we threw our jackets onto two chairs at a table immediately in front of where the band would be playing. Two hours later I could have stood up, taken two or three steps and shook the hands with the musicians. The music was what I needed after learning about the traumatic life of Gorky. It was to be duets featuring Tony Miceli on vibes and Kevin MacConnell on Bass, however, they invited two friends, Dan Monaghan on drums... the other friend was the last to show up, but I recognized him when he got there. Larry Mckenna had shown up to play sax. They played one wonderful standard after another. There are levels of uncertainty, like wondering what the band will play next. Tonight they didn't even know. After each tune they would huddle together and we would listen in as they decided what to play. A few tunes in and we decided to stay for the second set. At intermission we checked out the hall on the ground floor where they keep the crafts. Then wandered back into the American Collection. We had travelled deep in when Mosaic Woman said, "Didn't you blog about that?" And I stood and prayed for a friend who was in the midst of huge uncertainty. Her husband was in the hospital and she didn't know why he felt so ill. I'm not sure if she does now, but he is better and out of the hospital. The painting commands attention. God is speaking to Mary. Mary is about to agree to God's plan... Tanner's Annunciation. And it is large, 57 x 71 1/4 inches. So I stood and prayed for my friend and her husband. And I imagined something that made me smile... it was a day in the future and my friend, and I were standing in front of that painting, which she so adores. My sister was asking me what I wanted for Christmas and I said, "jazz, " but I wasn't getting around to sending her anything more specific. That is when my friend, Curt, stepped in with a wonderful blogpost which showed me how amazingly far I was out of the loop. So I sent her the link and waited. Christmas day came without any CD's. So much with being curious, now with extra cash I was in charge of choosing. Then Curt put out a second list at his blog, which made choosing twice as hard. OK, then I had to chose a Wayne... They did not have Wayne Wallace's 2009 CD, but we have been loving his The Nature of the BeatSame with Bobby Broom, CD's to pick, but none from 2009. Again I am happy with what I came home with Song and Dance. Nothing was to be found by hammond B3 player, Akiko Tsuruga or jazz singer Elli Fordyce. I downloaded Elli's Songs Spun in Gold and it became the last CD bought and listened to in 2009, as Mosaic Woman and I went one last time into our studios. OK, so here it is 2010 and I am still helplessly behind. But that is OK. I will sit back and listen to what Curt has to play ... old and new.